Q: How do you approach the 2nd leg of the cup match being away vs Toros Neza USA? A: The same as the previous 2 games. We know we will be facing tough opponents who are desperate to win because of how results have gone for us so far. We will have optimism for a result but wont be expecting anything other than a hard fought contest. Q: What’s your team’s comfort level away from home? A: I dont think we treat the game any differently than when we are at home. I think the only thing that has any impact on us is the type of field we would be playing on, turf or grass. Its not something I put much emphasis on to be honest. Q: There have been some fierce battles between these two teams, how do you manage that emotion? A: I have a lot of respect for Toros Neza as they like to play the ball and every game we have had with them has been a fight to the final whistle. I expect nothing different on Sunday. Q: You’re coming off 2 wins in the cup, how do you keep the lads focused to finish the job? The lads are already motivated to retain the Cup so as defending Champions there is a lot of pride in the players and thats reflected in the attitude of the supporters who have been magnificent for us in this tournament. 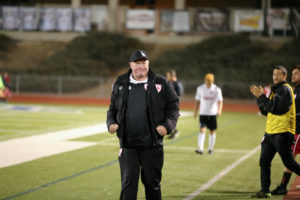 The hardest part of the job is selecting an XI as I have 20 players who all want to represent Temecula Football Club.